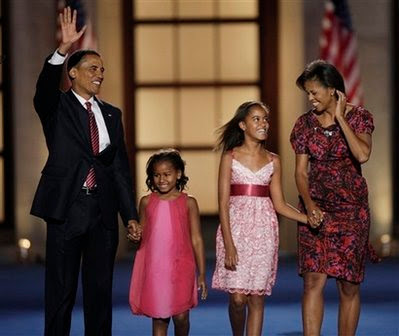 Hooray for the Obama family! Americans love a naming trend and they love to show their patriotism. Thus, a new president's name often gets a bump in the Social Security charts after he is elected. For example, "Grover" was #410 in 1880, but jumped to #20 during the election of 1884 and stayed in the top 100 for a decade. "Woodrow" was obscure (#1049) in 1900, but hit #46 in 1912. "Franklin" hovered between #119 and #187 for the first 32 years of the 20th century, but rocketed up to #33 in 1933. Obviously, it's difficult to see any appreciable bumps after the election of a William or a John, but I think we will probably see "Barack" break into the top 1000 soon enough. In honor of our new president, I took a look through the census records and found lots of little Americans who have been named for our presidents. Unsurprisingly, they often travel in sets. *After Hoover, it gets a little tricky because the post-1930 census records are not available yet. Ancestry makes some state birth records available, so I have used these, along with some marriage records, to find presidential names after Hoover. Unfortunately, the lack of census records makes it difficult to find matched sets of siblings. Did you tell me about this, or did I pick it up somewhere else? Yeah, I love that thing. It's so cool! One pattern it reveals is the popularity of different initial sounds in different decades. Try typing in strong consonants like D, P, R, or S, and you'll see a bell curve centered on mid-century. Vowels produce the opposite effect — A, E, I, O all have bowl-shaped curves. great idea. my wife wasn't going for the name Abraham Lincoln Katz... but such is life.